(TibetanReview.net, Jun19, 2017) – The Dalai Lama touched on a range of values of universal concern in his commencement address Jun 17 at the University of California San Diego before a capacity packed audience of 25,000, including some 6,000 graduating students. In his welcome address, Chancellor Pradeep Khosla said the 1989 Nobel Peace laureate’s message of compassion aligned with the university’s mission, as the school attracted like-minded humanitarians. 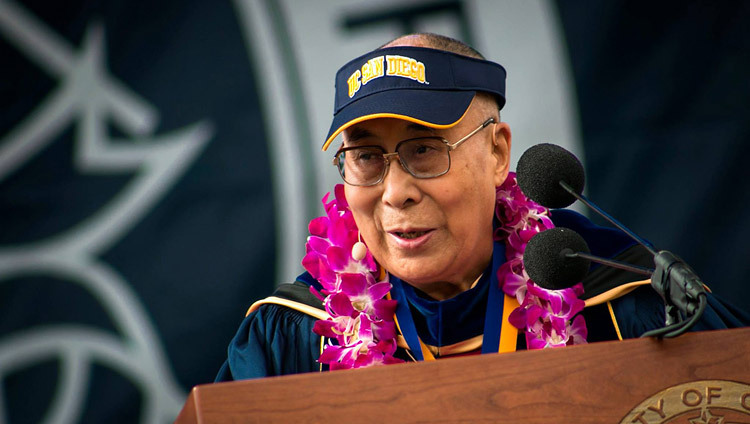 And the Chancellor presented the Dalai Lama with the UC San Diego Medal, which he described as the school’s highest honor, with only 12 having been awarded since 1987. The exiled spiritual leader of Tibet stressed the connection between inner happiness and world peace, the value of ancient philosophies in modern education, balance in life and the need for a “compassionate cultural revolution” in China, noted a sandiegouniontribune.com report Jun 17. The report said his 20-minute address was both light-hearted and serious, urging people to work together for a common goal and to strive for a peaceful world. To the students, he offered advice to combine “warm happiness” with their brilliant minds to create the inner peacefulness needed to better the world, stressing that happy family, happy society, was very much dependent on inner peace. Noting that lasting peace of mind could be achieved by tackling our destructive emotions on the basis of understanding the whole system of our emotions, the Dalai Lama said understanding the workings of the minds of the seven billion people on this earth was as relevant and necessary today as it was in the past. And since understanding the workings of the mind and emotions and the application of logic were not confined to Buddhist studies, he said they could be subject to an open academic approach, a project UC San Diego might consider exploring. He also extolled the power of dialogue and reconciliation and how these ideas were crucial to make the 21st century a more peaceful one. “And you, the younger generation, have the responsibility to solve this, not through prayers but through action,” The Dalai Lama said, encouraging people to work towards putting a stop to division and violence throughout the world. He also said modern education was oriented on material value, but it was important to know the deeper “map of emotion” to achieve real inner harmony. About 3,500 Chinese nationals attend UC San Diego, and a section of them, led by the Chinese Students and Scholars Association (CSSA), had vigorously opposed the invitation to the Dalai Lama. The CSSA has ties with the Chinese Consulate General in Los Angeles to promote “news and messages from the government to our members” and its members used some of the same rhetoric as the Chinese government to oppose the Dalai Lama, reported college.usatoday.com Jun 17. They were reported to claim that he stood for divisiveness with the goal of achieving Tibetan separatism from China. The Dalai Lama, on the other hand, has for decades been seeking dialogue to ensure the protection of Tibetan culture and identity through genuine regional autonomy for Tibet under continued Chinese rule in accordance with the provisions of the country’s existing constitution. China, however, refuses to talk to him, saying there is no Tibet issue to be discussed. At the commencement ceremony, only about a half-dozen Chinese students walked out as the Dalai Lama was introduced. The day before, the Dalai Lama, gave a public address at the same venue, the RIMAC field of UC San Diego. He was introduced to the capacity-packed audience of 25,000 by San Diego Mayor Kevin Faulconer who said he was proud to welcome the world’s greatest champion of peace, His Holiness the Dalai Lama, to the city of San Diego. “As a city that celebrates its diversity, spirit of collaboration and environmental leadership, we are proud to welcome one of the world’s great champions for peace and understanding to San Diego,” Faulconer was quoted as saying after the meeting.